Believe it or not, the flavor of kingfish is unmatched. It can either be prepared in a hot and spicy curry or can be grilled with different types of marinades. We're going to try the latter option for making today's kingfish recipe. The real flavor comes with the miso paste we've used for the marinade. It is primary flavoring agent and gives a unique taste to this fish recipe. For best results, use a charcoal grill and serve hot. If miso is not available, you can use white soya beans blended in a smooth paste. 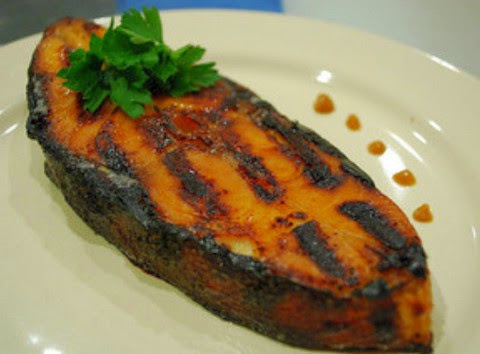 Before grilling the fish, make sure it is kept in the marinade for at least 1 hour. Leftovers of this delicious recipe can be included in a spicy gravy and can be served in curried form with fried or boiled rice preparation. Enjoy this sharp flavored grilled kingfish fillet coated with delicious miso paste enhanced with pungent and lip-smacking spices in moderate quantities. Take a bowl and add miso paste, ginger paste, onion powder, garlic powder, paprika, red chili paste, lime juice, dark soy sauce, olive oil and salt in it. Whip it for a minute and keep aside. Though it is not necessary but piercing fillets with a sharp fork can ensure that the marinade go deep into the fish pieces. Apply the flavorful miso paste on each fillet with your hands. Cover with aluminum foil and refrigerate for half an hour. Prepare a charcoal grill on a medium flame. Place all the fillets carefully on the grill. Grill from both the sides for 4 minutes each. If you feel the flame is high, you can reduce the grilling time.